New Thought, so far as this Author is concerned, may be considered to mean exactly what it says; namely, it defines and describes a way of thinking which, if and when compared to the conventional or already-established modus operandi, is indeed new, or for want of an alternative descriptive word, different. This in itself is nothing new or only transpiring in our present time and generation - across virtually the whole stretch of human history, departures from the established way of thinking have manifested themselves; each of which can be considered an example of New Thought. On some occasions, said departures have been met with opposition, or even attempts to suppress them - on others, the previously-established conventions have, either gradually or swiftly, passed away, to be replaced by the new way or ways of thinking. And it is a reasonable assumption that, even in the future, these sequences shall present themselves. Before, so-to-say, getting into the "nitty-gritty" of the matter, it is not the intention of this Author to convince or compel anyone visiting this page or any other page of this Site that they should "get into" New Thought - any such decision will be made by the visitor, and hopefully, it is made of their own free and clear choice. All that shall be put before the visitor is sufficient information on the subject of New Thought - in terms of: * what it is * what it is not, and * some (if not all) of the features and benefits that result from its proper application, together with sources of reference with which the visitor who desires to do so may investigate the subject further. Having stated the preceding, the Author shall now state his own definition of what New Thought is. 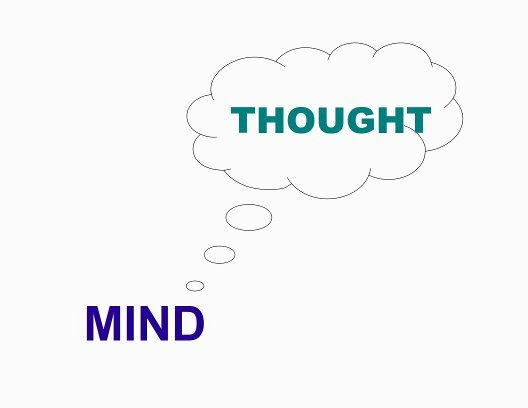 For the purpose of this discussion, New Thought refers to that way of thinking that, so-to-say, encompasses both an understanding of what might be aptly called the natural relation that exists between Thought or Mental Action and Material Results (i.e., results in one's physical world), as well as the practical application of that understanding. The subject has been known, and is currently known by various names and terms; some of which are still in circulation in our present time; metaphysics, mental science, divine science, science of mind, just to name a few, and one or more of those terms might be more familiar to the visitor. Nonetheless, and as stated before, when the phrase: New Thought is mentioned here, it carries the same meaning as any other term or name. 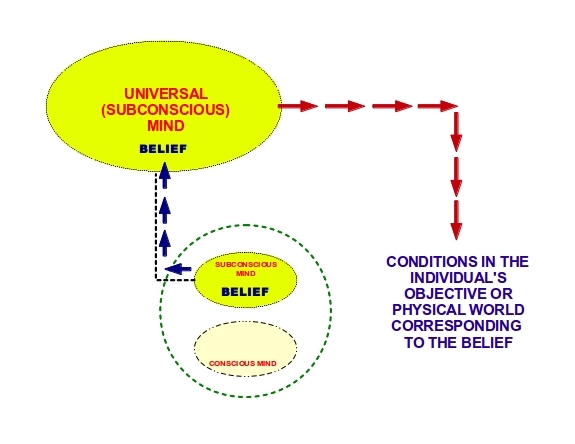 STEP 1 - The individual forms and establishes a Belief in their mind, regarding some object they desire to see realized (more details are given in the discussion on How The Mind Works). 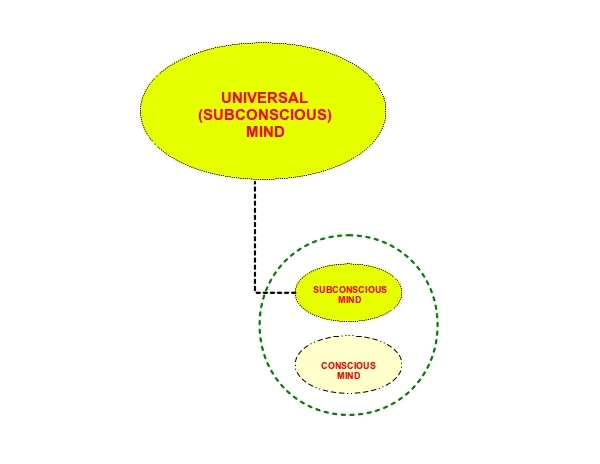 STEP 2 - Said Belief, resident in the individual's Subjective or Subconscious Mind, instantly passes into the Universal (Subconscious) Mind, by virtue of the established axiom that the individual Subjective Mind, notwithstanding the individualization, remains perpetually connected with the Universal Mind (refer to the previous discussion on Universal Mind). 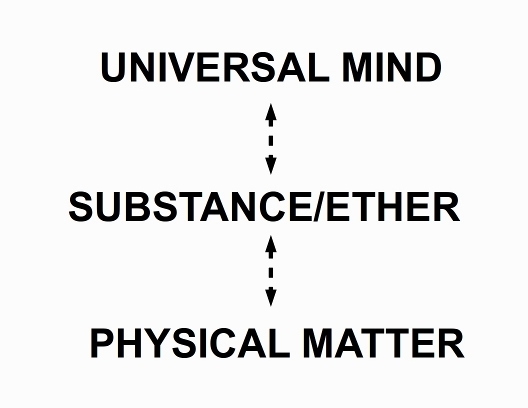 STEP 3 - Universal Mind, being the one true Creative Agency, immediately proceeds to create, or bring into being, conditions in the objective or external world of the individual, which corresponds or matches the Belief impressed upon it (once again, refer to the discussion on How The Mind Works). 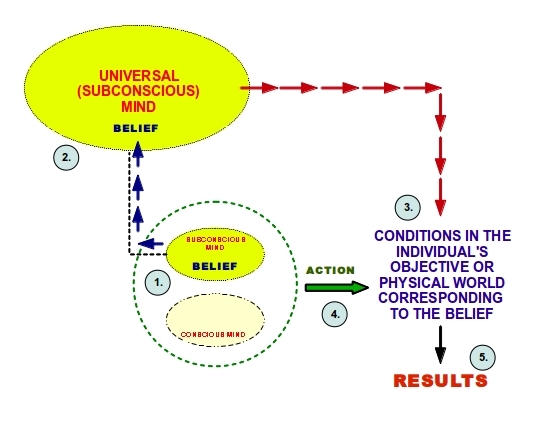 STEP 4 - When the individual recognizes that the corresponding conditions are present in their personal world, they should proceed to take action upon them, and any and all actions performed are, so-to-say, backed by the same mental state (call it Faith, Belief, Expectation, or any other name), that served to cause the creation of the desired conditions (refer to the discussion on the Bible Promises). STEP 5 - Only if and when the preceding for steps are executed properly by the individual, do the Results present themselves in the individual's personal world. At this point, it is the Author's wish to politely impress upon the visitor, that the steps presented hereabove are not intended to represent any specific rules or instructions for the practical application of New Thought, although, if and when viewed from a particular perspective, they may indeed be considered as such. Expanding the point further, many (if not all) of the established and recognized authorities - both past and present - on the subject generally advocate that New Thought is not a set of mechanical rules laid down by some teacher or instructor to be followed unquestionably. Also connected with the preceding point is the postulation that New Thought is not (as one such authority put it) the name of a particular sect, or any other such group or body adhering to any specific doctrine. The last point is, in all likelihood, very much reflected in the presence of organizations (whether they refer to themselves as Churches, or via any other name) which, according to a web search, can be found as located virtually all over the world, who profess to advocate and practice New Thought, but, on investigation, there are many instances where said organizations conduct their various activities by varying and different methods and practices. Of course, and as stated before and elsewhere, the preceding points are merely put before the visitor, who, in turn, is free to agree or disagree with them, and, if he or she so chooses, may investigate the matter for themselves. Having stated the preceding, some attention shall be given to what might amount to an obvious question to any who are encountering the subject for the first time: what is to be gained from the practical application of New Thought? There may perhaps be many differing ways to respond to such a question, but, rather than attempt to list many, the Author would volunteer this one: an individual person acquiring the ability to make their personal life, more and more, into exactly whatsoever they might conceive and desire it to be, via their own effort. To the uninitiated or the skeptical, this might, on first glance, appear to be some "pie-in-the-sky" suggestion of something to be attained or accomplished as a result of adhering to a particular doctrine or dogma, but, if one steps back and views the whole matter objectively, such a suggestion is not only to be offered (in one form or another) by New Thought, but also by many (if not all) other religions and philosophies, and is even to be found in various areas of the so-called "secular" world. And, in the event that it has not been stated previously, it is raised here that New Thought is not a recent discovery or innovation - far from that, its content and underlying message is, literally, as old as recorded human history (if not older), but, generally speaking, has only been apprehended by a relatively small percentage of the human race in past times, but in this so-called Information Age, it is steadily becoming more visible to increasing numbers. Everything in the so-called physical universe is ultimately derived from that infinite and eternal entity generally referred to as Spirit or Universal Mind. It has been reasoned out and deduced by many of the wisest individuals who have ever walked the planet (in one form or another) that the Action of Mind, or Thought, is the one and only Creative Agency, which brought the universe and all that is therein into existence. Out of said reasoning and deductions comes the postulation that Man (or to be more technical, the Mind of Man) is an individualization or miniature reproduction of Universal Mind, and therefore, the Thought or Mental Action of Man possesses an identical quantity of Creative Power. As a result of Thought possessing Creative Power, the Thoughts (or more precisely, the Beliefs) established in the Mind of any Individual Mind, if maintained, inevitably lead to the formation of corresponding conditions in the individual's personal world. And, in addition to all that has previously been stated, is another postulation - one which has been mentioned previously in one or more discussions - which states that not only is Thought or Mental Action a Creative activity, but it is also Perpetual, i.e., it is always and forever setting some sort of sequence of causation into motion, both on the scale (so-to-speak) of the Universe, as well as on the scale of the world of the individual, and that Thought can never ever be divested of its creative quality. Put simply, each and every person, whether they do so consciously or unconsciously, is setting some act of creation in motion, which, if permitted to run its course, will inevitably produce some corresponding condition, not only in their personal world, but even in the collective world of the entire human race - a point first raised in the discussion on Anima Mundi. Granted that, in times past, the knowledge of such things might have been scrupulously guarded, a case can be laid and established that the hoarding away of such knowledge can no longer be the modus operandi of the present-day world. Any and all attempts to do so, is essentially to retard the forward progression of the human race beyond the point where it has now reached, which itself contradicts the forward and upward tendency of the Original Creative Power towards increase, expansion and fuller expression of Life. And as also stated previously, it is actually the purpose of all systems of teaching and instruction on the overall subject of the Mind - irrespective of the particular form any system takes - to impart that knowledge to its students, so that, gradually yet surely, they will awaken to the safe and beneficial employment of their creative faculties, and New Thought is but one such system, by which this is to be accomplished.